The perennial problem with films based upon jokey conceits is that the joke will often wear thin when it is stretched to feature length. Machete is 105 minutes long, but perhaps it was a more natural fit for the two and a half minute trailer that originally introduced the character. That trailer was conceived by Robert Rodriguez as part of the Grindhouse package he and Quentin Tarantino offered to filmgoers in 2007, before discovering that the majority of filmgoers weren't particularly interested in their deliberately trashy homages. 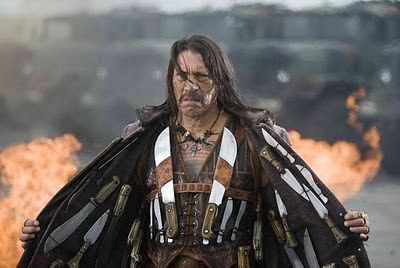 Nevertheless, it appears enough people subsequently pestered Rodriguez about the possibility of a feature length expansion on his trailer to make Machete a cinematic reality. Be careful what you wish for. Anyone who has seen Machete in its trailer form will already know the story. This film sticks closely to the narrative already established there, even recycling a couple of shots and lines of dialogue, but it possesses a few more big names in the cast alongside Danny Trejo, Jeff Fahey and Cheech Marin. Those actors are important to Machete, because in his first starring role, Danny Trejo doesn't bring much to the party aside from some monosyllabic grunting and a face that looks like it has taken a beating from life. Granted, Rodriguez doesn't ask for anything beyond that from his leading man, but the lack of wit, passion or energy in Trejo's star turn has a deadening effect on the picture. He stalks through the movie wearing a permanent scowl, slicing off limbs and heads with his trusty weapon of choice, but watching scene after scene of such action does grow awfully repetitive. Occasionally, Machete displays a sense of outrageous invention that enlivens the whole movie. In one scene, arguably the film's highlight, a cornered Machete jumps through a window and swings into the floor below by hanging onto a dying man's intestine. That sequence gets a big laugh, but Rodriguez too often lets the pace flag and lets the energy levels drop in between such gleefully over-the-top stunts, attempting to inject some social satire into the film with his depiction of America's reliance on its immigrant underclass, but that element of the film doesn't really take us anywhere. Rodriguez has a co-director credited on this production, with editor Ethan Maniquis stepping up, but it's hard to tell what effect, if any, that has had on the film. The direction, as is often the case with Rodriguez, is slack and uneven, making it difficult to discern exactly how much of the film's slapdash appearance is part of the bad movie tribute and how much is a result of the filmmaker's limitations. Some mild relief is provided by that eclectic supporting cast. While a couple of them (like an alarmingly bloated Steven Seagal and a typically expressionless Jessica Alba) struggle to impose themselves on the film, the majority have fun with their roles, and their enjoyment is infectious. Robert De Niro, Jeff Fahey and Don Johnson are all on ripe form, while I particularly enjoyed Cheech Marin's turn as a shotgun-toting priest ("God has mercy. I don't"). However, these are just bits and pieces scattered throughout the film; entertaining scraps in a picture that cannot sustain the generous running time it has set for itself. Machete is lazy, self-indulgent and surprisingly dull, but I'll say this much for the film – it would probably make a great trailer.